Culminating in the year 2002, a global shift in both abalone availability and distribution has occurred. Country by country abalone reporting by FAO for both wild caught and cultured abalone changes significantly when further dissected and standardized. The FAO practice of reporting totals for “abalone shucked or not” and the continuing practice of some countries that still report their production by large groups of species, distorts both historical and current totals. Further review shows, that the overall world supply of abalone, as a result of continuing increases in cultured production, combined with an unfortunate continued increase in the illegal wild catch, is approaching the historical abalone abundance of the mid 1970’s. However, major shifts have occurred when these dynamic changes are analyzed. These significant shifts demand inventive thinking on the supply side if prices are to remain at strong levels. Examples are given of approaches employing new creativity in the world of abalone marketing, distribution and processing. An understanding of the dynamic changes in the world’s abalone supply requires a comparison of the decade of the 1970’s with the most current year: 2002. The abalone world of the 1970s was one with minimal regulation of the fisheries sector, little illegal catch, and a cultured “market size” industry measuring production in kilograms, not tons. 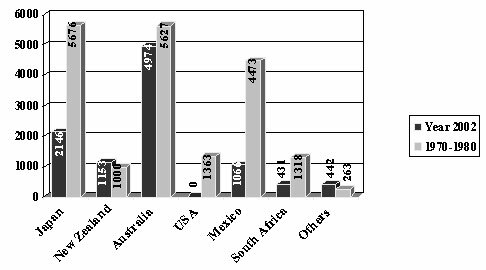 In sharp contrast is the year 2002: two major abalone fishery countries (USA and South Africa) have either closed the fishery entirely or have threatened closure. During this same 3 year period the illegal catch has run rampant to the point where it now approaches 40% of the total legal fisheries. Nonetheless, much of the fisheries shortfall continues to be replaced through abalone farming. These factors lead us to the conclusion that the world’s supply of abalone (Fisheries, Cultured and Illegal Catch) in 2002 now exceeds what has been considered the “heyday” of world abalone supply during the 1970’s.This surprising return to substantial supply quantities (in which the Illegal Catch plays no small role) suggests that substantial brand identification, specialty processing and other marketing efforts/innovations are needed. 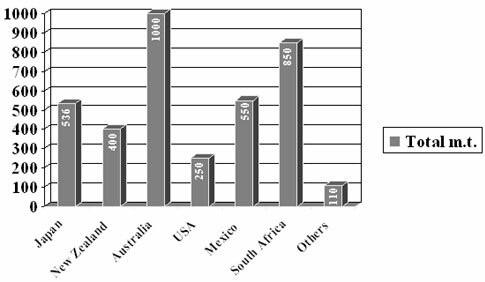 Abalone Fisheries: The total allowable annual commercial landing quota (country by country). This category includes the planting of seeds in large areas of the sea wherein the sea bottom has not been prepared with man placed rocks or structures. This definition does not include the legal sport catch or any illegal catch worldwide. Cultured Abalone: Includes both the farming of abalone on land or sea - -contained in man made tanks, nets or structures (Intensive Culture), and in-sea planting of abalone seeds in artificially arranged substrate or structures, with or without adding food (Extensive Culture). Illegal Catch: Any world harvest of abalone beyond the total allowable annual landing quotas. It is well known that overfishing, disease, habitat loss and failed governing body management of the illegal catch have all contributed to the decline of the abalone fisheries catch over the past 3 decades. There has been improvement in all but one of these factors (the illegal catch). Figure 1 illustrates country by country Fisheries landings for the year 2002 as compared to low to high range averages for abalone fishery countries in the decade following 1970 (FAO historical data 1970/1980). Certainly there was some illegal catch of abalone 2-3 decades ago; however it pales in comparison with the massive illegal take from the late 90’s to the present. Despite a myriad of laws and penalties in many countries, the illegal catch continued in 2002 at an unprecedented pace (see Figure 2). The relationship of the market price to ease of capture has developed a criminal market (in major producing countries they are well organized, well financed and often armed). The entire USA abalone fishery was closed indefinitely in 1997, yet the illegal catch continues at over 120mt per year (California Department of Fish and Game. 2002). South Africa’s law-enforcement authorities have been engaged in an armed battle to stop that country’s illegal catch for a number of years. South African Police (SAPS) six month figures show 431 arrests between August 2002 and January 2003, with the admission that even with this strong effort “a lot of abalone are getting past us”. (Groenewald 2003) For the year 2003, the SA Fisheries Department is considering closing down any form of abalone harvesting once current rights expire. It is estimated that if poaching continues at the current rate, abalone will be fished to extinction in less than three years (Duvenhage 2002). The situation is so acute that for the year 2002 the illegal catch has been estimated at more than double the 350 m.t landings of authorized permit holders. (Tarr 2002). The Illegal catch in other abalone producing nations is substantial with deep-felt concern in Australia, Mexico, New Zealand and even Japan. There is also a notable illegal catch in other abalone Fisheries (Korea, Philippines, Taiwan, and other Indo-Pacific countries). Figure 3 illustrates the total cultured production as reported within each country (see Acknowledgements). The phenomenal growth of the world cultured abalone is evident when comparing the 8,696mt for the year 2002 with just 689mt 15 years earlier (as reported the first International Symposium on Abalone Biology, Fisheries and Culture, La Paz Mexico November 1989). Worldwide, more than 15species are now being commercially cultivated with over a thousand individual farms with individual production ranging from less than a ton to over 200mt. 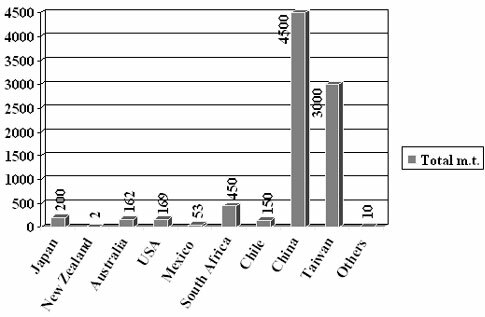 Figure 3: 2002 World Cultured Abalone Production. Notes: Totals of Fisheries, Illegal Catch and Cultured Production are combined. Total of figure 1 (fisheries), figure 2 (illegal catch), and figure 3 (cultured production) in metric tons. 1970/1980 – average of high and low years China and Taiwan (1970 to 1980) estimate of early cultured production. INDUSTRY CHOICE: GENERIC SELLING OR MARKETING? 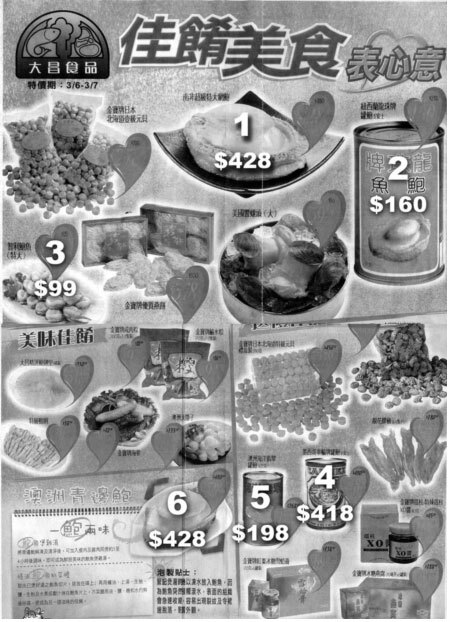 Figure 5 represents a rather typical newspaper advertisement (in this case a “supermarket” in Hong Kong). Referring to footnote numbers we have superimposed onto the ad: “1” is frozen abalone from South Africa and “6” Frozen Green Lip from Australia. The ad merely sells frozen abalone from South Africa and Australia at the same price: there is no description of location within the country; there are no brand names, and no reference as to the quality of the supplier’s preparation process. While some older buyers have biases as to one species or another, others would pay more for further guidance other than country of origin and “frozen”. The Supermarket’s suppliers by default become “generic” i.e. the sellers to the supermarket were merely selling frozen abalone, with little attempt at well deserved and meaningful individual supplier or cooperative supplier marketing effort. Contrast this with the marketing effort (figure 6) showing the cover of a processors brochure with brand name directly appealing to Asian markets. Inside the brochure are references to the specific waters and other perceived advantages of purchasing this brand name whether fresh, frozen or canned. This strategy will, over time, result in continuing higher profits for this processor. Figure 5 also identifies: “2” New Zealand canned, “4” CalMex brand from Mexico, and “5” Canned from Australia. Canned abalone of necessity have some “brand” name on the can label as is the case “2” and “5”, however the price of “2” and “5” are in the same range, while CalMex “4”, with only slightly higher net weight commands nearly double the price - - an example of strong brand name marketing and recognition. There is further marketing opportunity in specialty processing/ preparation of abalone in any of its various forms. 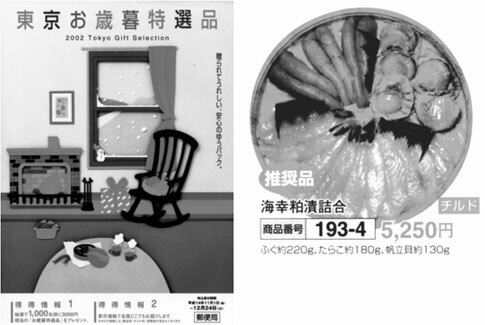 Figure 7 displays the cover of a holiday food catalog (very big business in Japan) and a selection picturing abalone as a mixed, pre-packaged presentation along with other seafood items. The price to weight ratio of this style marketing is astounding. In addition to branding and other meaningful promotion, fresh marketing approaches to newly created specialty markets can yield substantial rewards to the abalone supplier and processor. One of Fishtech’s Australian Clients is currently working with a unique frozen processed product to Asia, transforming “generic” abalone into a much higher margin product. In 1989 the USA was one of a very few substantial cultured abalone producers outside of Asia. The average prices received by US farmers for this “little known” product in the year l989 was in the $30/36kg C&F range (actual bids/ Japan 1989). In the year 2002 the same price range of $30/36kg C&F was received by cultured producers for live product, non-withstanding worldwide awareness of the high quality, excellent taste and consistent supply. Although there is no legal fisheries product available today from the US and Canada, similar pricing scenarios can be developed for live product in the Fisheries sector, with beach prices in the late 80’s in the US and Canada no more than equating to today’s prices on an inflation adjusted basis. Similarly, Prices received by the Fisheries and Cultured producers in South Africa and Australia, were in the US$30/36kg C&F range in 1998 (adjusted for live product) with little or no change in the 2002 prices received. This is the same US$ price (without adjustment for inflation) as was achieved 23 years prior. The downturn in some Asian economies and in particular Japan has certainly played a role in this downward price pressure; however a powerful factor has been the huge Illegal Fisheries sales into the world marketplace. The abalone industry is currently suffering from the proliferation of the Illegal Catch. Unless governmental enforcement is substantially increased, the continued taking of these often immature animals will irreparably endanger the resource. This Illegal Catch also applies an important downward pressure on abalone prices as these abalone are most often sold in “peculiar” channels at well under commercial market prices. The slow recovering economy in parts of Asia also plays a role in suppressing prices. Nevertheless, whether considering the Fisheries or the cultured industry, abalone in most all of its forms remains considerably under- priced for this “shellfish caviar” product. The time has long since come for those willing to put forth the effort to fully understand the current and new distribution chains (in particular China) and specific target distributors, wholesalers and mega end users (DWE’s). Next comes needed effort in processing and branding with realistic product marketing programs, both on an individual company basis and through “yet to be developed” abalone marketing co-operatives. Contributions were made by: Tomohiko Kawamura (Japan), Nie Zong Qing (China), Arthur Seavey and the California Aquaculture Association (USA),Enrique Vazquez Moren (Mexico), Cristobal Borda (Chile), Steve Edwards and Steven Reynolds (Australia), Rodney Roberts (New Zealand), Nick Loubser and Peter Cook (South Africa), Terrence O’Carroll (Ireland and Europe), and Alawai Salim Al-Hafdh (Oman). California Department of Fish and Game. 2000, Marine region, Punch Card Tabulation. Duvenhage ,G. 2002. South African officials fighting losing battle to Hong Kong gangs, South China Morning Post, Dec 01, 2002.